Taking that 10% tax credit for a high efficiency wood stove you bought last year? If you use tax software, it can be difficult. TurboTax and Tax Act don’t mention wood stoves, and you have to learn from another site that you need to put it under “energy efficiency building property.” H&R Block is the worst; providing no obvious place to enter “energy efficient building property” and telling users they are not entitled to a credit. 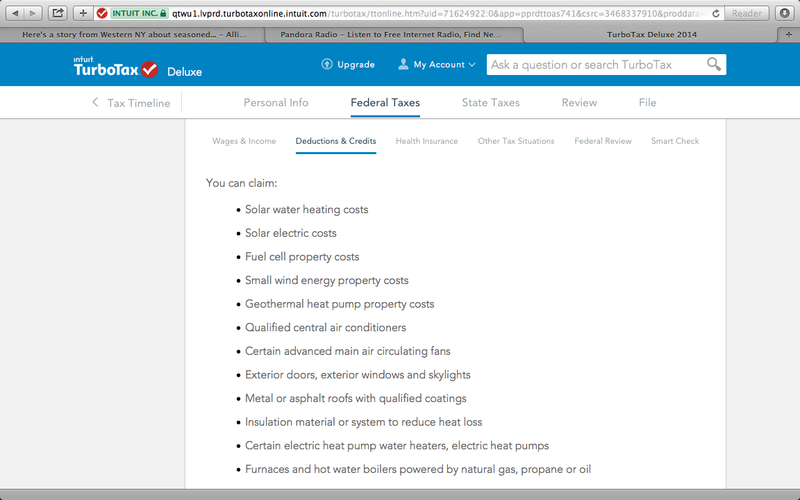 2015 update: Turbo Tax still does not list qualified biomass burning stoves in its main list of equipment eligible for the tax credit, but a later page does, if you know to click on "energy efficient building property. "We’d bought a high-efficiency wood stove, which entitled us to the tax credit. TurboTax didn’t seem to mention wood stoves anywhere. All sorts of energy-efficiency improvements, including better windows and solar electric panels, qualify for credits. I found entry blanks and explanations for each but nothing for stoves. At the IRS.gov site, I learned that a wood stove should be entered in the category of “energy efficient building property” and that the agency considered it a biomass-burning device. Thus schooled, I entered it and received the $300 credit in both TurboTax and TaxAct. But Block stymied me. It provided no obvious place to enter “energy efficient building property” via its interview and told me that we were entitled to no credit." The full NYT story has more comparisons of the three tax softwares, but nothing more about biomass heaters. Jon Strimling, founder and CEO of woodpellets.com, the nation's largest on-line retailer of wood pellets and a Board member of the Alliance for Green Heat, has stepped down as CEO of woodpellets.com. He remains active as a woodpellet.com board member and consultant to the firm. Jon, a graduate of MIT, has been highly motivated by the opportunity of switching to a low-carbon, low-priced alternative to oil and propane. Jon is also a founding member of the Alliance for Green Heat and has supported our work that focuses heavily on assisting low and middle-income families to affordably heat their homes with cord wood and pellets. Jon continues to serve on the Alliance Board and one of his longtime interests has been to find ways for federal low-income heating assistance (LIHEAP) to help move families to lower cost, renewable heat. Jon has fought to bring European models of heating policy to America, which favor using biomass for their highest efficiency uses. "Building Woodpellets.com over the past five years has been an honor and a thrill. I'm looking forward to seeing WoodPellets.com continue to thrive. It's an exciting time for both this company and the industry, as so many people turn to wood pellets for a more cost effective, greener heating fuel." Jon is charting his next move and when we called a few days ago, he was in his basement admiring his newest toy: a Harman pellet boiler that he outfitted with an automatic pellet feed system. The Next Generation Wood Stove Design Challenge will be launched later this month and run through the fall of 2013. We have been building an impressive list of partners to support it, lawyers to make sure we have dotted our “i”s and crossed our “t”s, and, maybe most importantly, reaching out to dozens of university engineering departments and stove manufactures. Could a wood stove be as efficient as a natural gas furnace? Could it be as consistently clean as the cleanest pellet stove? What “smart” features would consumers want in a next generation stove? What information could a stove provide in a digital screen that would motivate or help the operator burn more efficiently? Could your stove ever tell you the moisture content of your wood? Could it tell you when you need to clean your chimney? Could it power your phone and lights in a blackout? Is there a market for a wood stove that ties into a solar thermal system? Would any of these features – or others – motivate people to trade in older stoves and buy cleaner, modern ones? These are just a few of a long list of questions that we and others have been asking for years. We hope this Challenge will begin to provide some answers and awaken consumers to the possibility that a new generation of clean burning stoves may be on the horizon. We want to thank everyone who has provided input into designing the Challenge so far. If you have input, please feel free to contact us at info@forgreenheat.org. The Maryland Wood Energy Coalition, organized in April, 2010 and composed of university, state agencies, private representatives and nonprofit representatives – including the Alliance for Green Heat, recently released a report for Maryland Policy Decision Makers and Citizens titled A Prospectus For Advancing Biomass Thermal Energy In Maryland. The 20-page prospectus provides research‐based information and policy recommendations to increase the adoption of advanced wood energy technology in Maryland. Officials from the Maryland Energy Administration and the Maryland Department of Natural Resources were among the key authors. The Alliance was also very involved in the preparation of the report and drafted sections that addressed residential wood and pellet heating. The effort was informally chaired by the University of Maryland Extension Service. The Coalition found there is great potential for residential scale technologies in the state, finding that over 7 billion BTUs of thermal energy are available from sustainably harvested biomass and could offset significant amount of propane, oil and electric heat. Establish programs to accelerate the transition from older technologies to efficient and clean technologies. Continue to support the Maryland Department of Environment’s $100,000 effort to change out older outdoor wood boilers. A well designed air quality/renewable energy program could effectively swap out older non-certified conventional wood stoves and give homeowners credit towards upgrading, several states, especially Oregon have designed effective programs to do this. Extend residential renewable energy property tax breaks for solar and wind to advanced residential wood combustion. Energy Performance Contracting (EPC) should include evaluation of biomass for heating and cooling systems. Expand focus on wood appliances in home energy audits, weatherization programs, and energy assistance programs. Maryland home energy auditors and contractors should be trained to better assess wood stoves or fireplaces for energy efficiency, contribution to the energy needs of the home, and safety. Weatherization and energy assistance programs should classify very old stoves as health and safety risk. Low interest loans or outright grants for biomass appliance assistance for homeowners. This program could provide a scaled financing system favoring low- income consumers. Envisioned is a rebate program or tax incentive for installing EPA certified wood or pellet stoves. Additional insights on the energy savings of residential wood heat can be found on pages 12 and 13 the report. Supporters of wood, pellet and corn heating plunged into the Potomac River on January 14th during a light snowfall to raise money for a group that fights global warming. 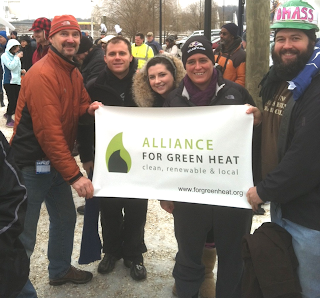 Pictured here (right to left), Sat Jiwan Ilke-Khalsa, head of the Takoma Park Corn Heating Co-op and an Alliance Advisory Board member, Delegate Heather Mizeur, who introduced a bill to incentivize residential biomass heat, Jeremy Crandall and Moira Moynihan, two of Heather’s brave and loyal staff, and John Ackerly, head of the Alliance for Green Heat. Team Biomass raised more than $1,500 for the Chesapeake Climate Action Network, a group that fights for renewable energy, including thermal biomass. Not pictured is Team Biomass’s bravest member: an 8 year-old girl who also dove into the river and is already becoming a wood heat activist. Others who took the plunge included Congressional Representative Donna Edwards and noted NASA climate scientist James Hansen, one of the very first people who brought climate change to the attention of policymakers when he testified on Capitol Hill in 1988.